In 2003, Barbra Streisand frantically tried to censor pictures of her home in Malibu after someone posted them online. In 2003, millions of people saw pictures of Barbra Streisand's home in Malibu. In what became known as the Streisand effect, attempts to suppress information about something usually backfires and leads to even more publicity for the supposedly secret thing. There is a strong argument in the weather community that we should ignore the growing number of people who sincerely believe that there is a worldwide governmental conspiracy to control the weather through, among other means, "chemtrails." Bringing attention to their cause, one may argue, only helps to attract more attention and thereby more adherents to this particular brand of anti-science. While that is probably true for a small number of people, ignoring the conspiracy theorists only makes them scream louder for attention through the Streisand Effect. The best way to remedy a situation isn't to bottle it up and pretend that it isn't happening, but rather to shine light on it and expose the silliness for what it really is. If you're not familiar with the chemtrail conspiracy theory, let me fill you in real quick. The thin, wispy clouds left behind by high-flying aircraft are known as contrails, short for condensation trails. 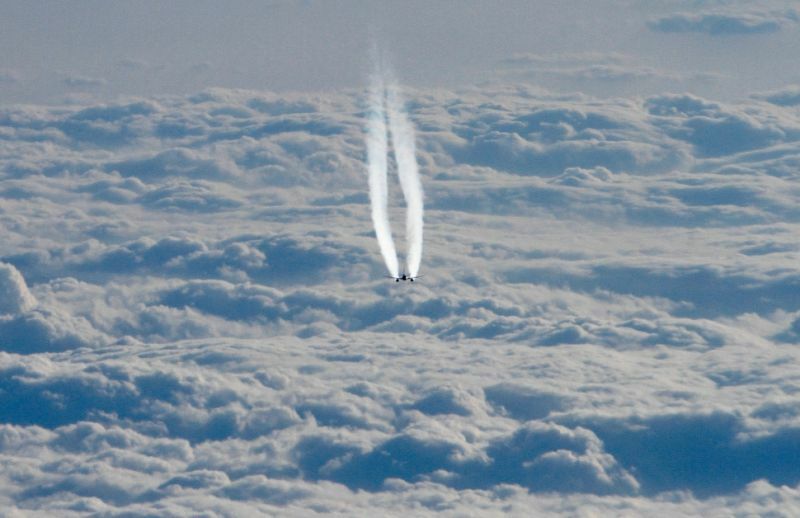 These clouds are left behind as a result of the warm, moist exhaust of the plane's engines meeting the extremely cold temperatures of the upper atmosphere. It's a similar principle behind why you can see your breath on cold mornings. Since about the mid-1990s, there's a subset of people who believe that these contrails are really chemtrails, or trails of vaporized chemicals being sprayed into the atmosphere by aircraft that are really flying around with with tanks full of chemicals rather than passengers. These alleged chemtrails are the work of any number of groups: governments, companies, Jews, you name it. The ultimate goal differs depending on whom you ask, but the two biggest strains of thought are that the chemtrails exist to control the weather or make the populace sick. For most people with a basic level of science education, the idea is absurd, but the conspiracy theorists truly believe that these chemicals are being sprayed to control the weather, make the population sick, or partake in other "geoengineering" activities. Back to the theorists themselves. Take last week's post on chemtrails, for example. It attracted a good bit of attention in the conspiracy circles, and quite a bit of ire directed towards me. Most of it is innocuous, with the typical name calling and impassioned cries of "you're a shill and you're wrong, we have the real truth!" Underneath the vitriol, you can sense that there's something...wrong, for lack of a better way to put it. For the most part these are not the rantings of people who have mental health issues or who are angry or have an agenda, but rather they are scared. They truly, deeply believe that there are people spraying us from above, and they are scared. When you're scared, you only accept what you want to hear from people. When the nurse tells you that the needle won't hurt, you smile because that's what you want to hear even though you know it's going to hurt anyway. The conspiracy theorists don't want to hear that their fears are irrational. They want a noble soothsayer to tell them that they're not buying into a bunch of manure and that somehow, someway, it's going to be all right because they have the truth. Education isn't the United States' strong suit right now. Kids are given a passing grade based on their ability to more accurately guess the correct answer on a multiple-choice exam than their classmates. Given the things I've heard even college students say, I am not at all surprised that people fall for anti-science. It's human nature to want to be informational hipsters — we've got to know exclusive information to which nobody else is privy. Look at Jenny McCarthy and her ridiculous anti-vaccine campaign. "Vaccines gave my kid autism!" No it didn't, but your Reign of Stupid is bringing us back to the early 1900s with the resurgence of completely preventable diseases. The fact that people would risk their child's life because a Hollywood personality told them vaccines are bad is mind-boggling, so it's not too much of a shock that people would fall for the hucksters telling you that Delta Flight 840 direct to Mobile is spraying the skies with toxic, weather-controlling, mind-altering, immune-system-killing chemicals. While we're on the topic of education, it would serve my point well to address and debunk some of the more popular myths and misconceptions surrounding contrails. THEORY: The abundance of high-flying aircraft producing contrails in patterns over major cities proves the existence of chemtrails. FACT: Major cities have major airports that serve as major navigational checkpoints on flight paths, especially large aviation centers such as New York City or Atlanta or Amsterdam. Airplanes follow predetermined flight routes that help air traffic controllers guide the planes to their destination safely. 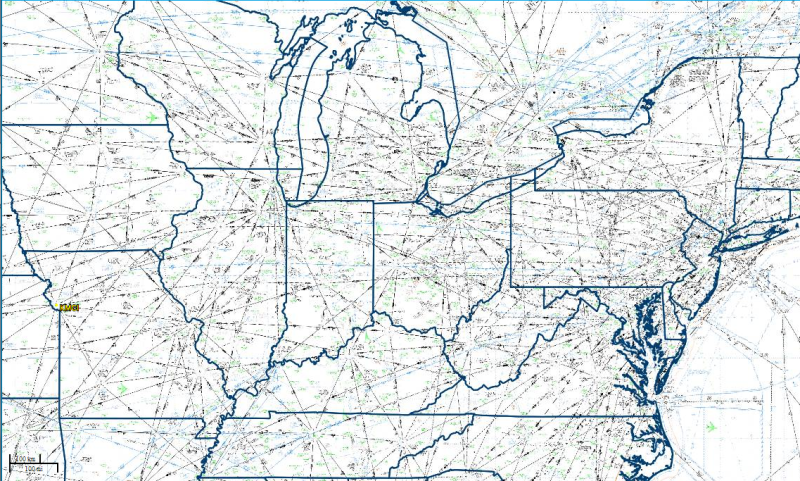 When airplanes are flying at high altitude in lines that frequently cross or parallel one another (see eastern North Carolina or St. Louis on the map above), they're going to leave a pattern of contrails in the sky if conditions are right for them to form. More today than ever before! THEORY: The sky has more contrails in it today than ever before! FACT: That's true. As more airlines take flight and more flights take off, there will be more opportunities for contrails to form. There are definitely more flights today than there were in, say, 1972, so the opportunity for aircraft to produce contrails is much higher now than it was a few decades ago. THEORY: Contrails didn't exist when I was a kid. This is a new phenomenon! FACT: Unless you're 100 years old, you were just an unobservant little kid. Contrails were there, just not as many as there are now. It's a simple case of not noticing something until you're suddenly aware of it. Case in point: you didn't think about how much you blink until I wrote this sentence. Now try not to think about it. THEORY: Contrails can take a blue sky and fill it with a thin deck of upper-level cirrus by the evening. FACT: That can be true in certain circumstances, too. 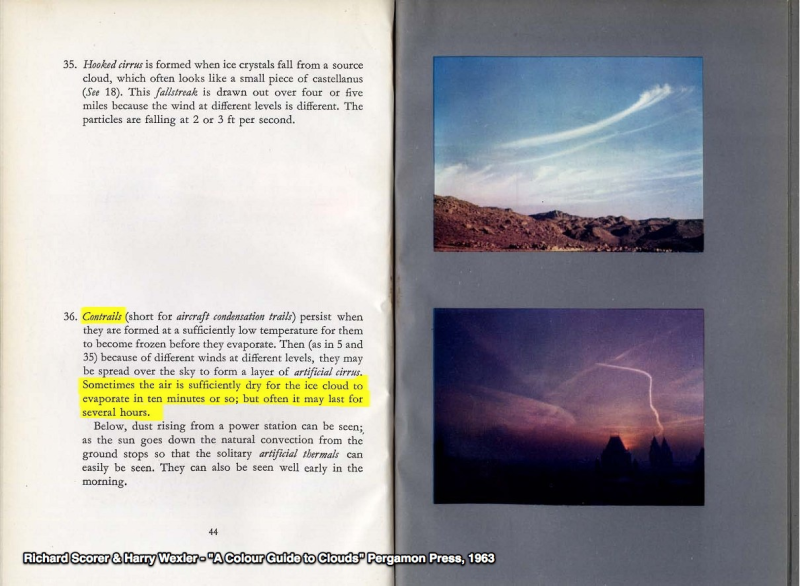 One of the big arguments of chemtrail theorists is that there never used to be "persistent" contrails like there are today. On days with high upper-level humidity, condensation trails can stick around for quite a while, and depending on the winds, they can spread out into a deck of cirrus. That's always been the case. It's nothing new. Cloud seeding is a real activity carried out by different groups and governments since the middle of the 20th century. The ultimate goal of cloud seeding is to trigger precipitation, with goals ranging from "just to see if we can do it" to "preventing hurricanes from growing into monsters." Precipitation forms and falls when water vapor condenses and collects on a nucleus, forming a droplet of water or ice crystal. When the water or ice becomes too heavy to remain suspended in the cloud, it falls as precipitation. The idea behind cloud seeding is to sprinkle nuclei into the cloud to hasten and enhance the process. 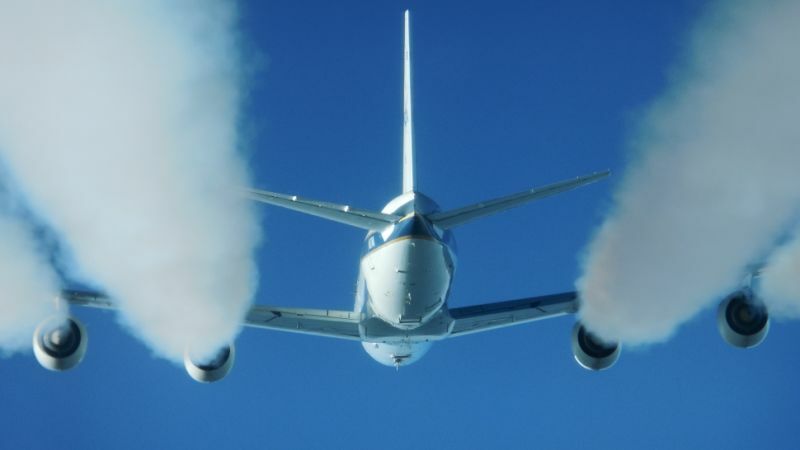 The main ingredient used in cloud seeding is a powdery substance called silver iodide, and it's used because it has a "very, very close" molecular resemblance to the structure of ice crystals, which makes it highly effective for use as a nucleus to spark precipitation. As explained in the above linked Scientific American article, cloud seeding has had limited success but scientists haven't been able to get it to work on a large scale or put it to use widely yet. Chemtrail conspiracy theorists use cloud seeding as irrefutable proof that all of their theories are valid, because "look! they're doing it here, so obviously they're doing it everywhere and with other chemicals, too!" That's a huge logical fallacy, but it's their main fallback and argument, so they stick to it until the bitter end. They're spraying us on landing! The message came with a link to a YouTube video called "BUSTED Pilot Forgets To Turn Off CHEMTRAILS while landing." FACT: The phenomenon in the video is called a "wingtip vortex." When an airplane's wing cuts through the air, the wingtips and edges of the flaps leave rapidly rotating tubes of air in their wake. These tubes of rotation are the cause behind the extremely dangerous phenomenon called wake turbulence. The air pressure inside of these vortices drops, thereby causing the air temperature inside the vortices to drop as well. When the air is humid, such as on a rainy day (as seen in the video) or when flying through a deck of clouds, the air temperature can easily reach the dew point, and the moisture inside the vortices condenses into the rotating tube of air you see in the video. No contrails on the ground proves they're chemtrails! THEORY: If contrails are produced by hot engine exhaust on cold days, and they don't happen on cold days at major airports, it proves that they're really chemtrails. FACT: Nope. In extremely cold Arctic climates, aircraft are known to produce condensation trails at ground level when they take off or land. It just doesn't get cold enough at the surface in most places on earth for it happen. Check out this photo taken in Canada's Northwest Territories of a Boeing 737 taking off and leaving a contrail in its wake. There's also a video of an LC-130 taking off at the South Pole (shown above) and leaving a contrail behind it, too. Aside from providing forecasts and life-threatening warnings, the ultimate goal of people who convey weather information to the public is to increase their audience's understanding of how the weather works and how a rainstorm in Arizona can be interesting to and even affect someone who lives in Virginia. My goal on The Vane is to make the weather interesting to readers while making the science behind phenomena like supercell thunderstorms and why Lake Ontario wouldn't freeze over this winter accessible to casual readers who might not care about the weather at all. When anti-science is allowed to grow and fester in the minds of people who don't have a baseline understanding of science or who are extremely gullible, it has a negative effect on society. As I pointed out above with the anti-vaccination movement, it's not just weather control conspiracies that can do serious harm to people. In my experience, when conspiracy theorists are in for a penny, they go in for a pound. Many chemtrail believers also think that HAARP helps to control the weather, and that vaccinations cause autism, and that 9/11 was an inside job, and so on. It's incumbent upon meteorologists and those who actually understand how the weather works to educate people and help combat the misinformation and anti-science when it rears its ugly head. That's why I write about this conspiracy theory so often. It's stuff that needs to be said.